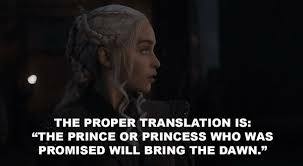 Why does Daenerys need a translator? We know that Daenerys can speak Valyrian. 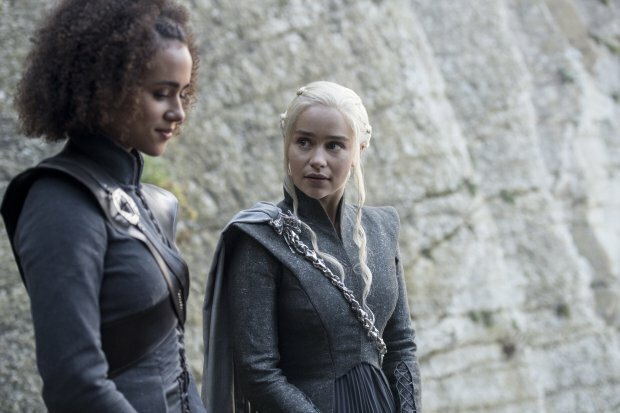 However when she is at Meereen as Queen, and also in the towns before it, she needs Missandei to translate for her what her people are saying in Valyrian. However we have seen her speak Valyrian, for example at the slave master of Astapor. So, why does she need a translator? First, let's not underestimate Messandei speaking 19 languages, despite not using them all and/or the work(s) (books, tv series) divulging and/or creating those missing languages. It is, in theory, an asset and no small feat. Missandei speaks nineteen languages including High Valyrian (her favorite), the Low Valyrian dialect of Slaver's Bay, Dothraki, the Common Tongue of Westeros, and has some knowledge of the functionally dead language of the Ghiscari Empire. However, I think when you go back and look at the incident with Kraznys and Dany freeing the Unsullied, we can see that the appearance of Dany needing a translator, can be used as a ruse to undermine her adversaries by making them think she is unworldly and inexperienced. But additionally, as another answer provides, she does in fact at times need a translator. Her Dothraki has been corrected by Messandei on at least one occasion ("Athjahakar" 3x08 Second Sons), and by her maids on others, as Khal Drogo allowed Dany to believe her Dothraki is better than it actually is. And Messandei also helped to better interpret the genderless/gender neutral identity of "The Prince that was Promised" when Melisandre proposed it to Dany (7x02 Stormborn). And lastly, and most importantly, Dany saw something relatable and good in Messandei and has become a kind of "true friend" and confidant, as both understand first hand the atrocities of slavery and both being woman in a world that is often unjust to women. She chose her because she felt it was right and meaningful (to her), not simply because she was a translator. They don't speak Valyrian in Meereen exactly. They speak a mix between Valyrian and their old language, known is Low Valyrian, while Daenerys speaks high Valyrian. They can understand her fine, but she has some trouble understanding them. Starting in Season 3, Peterson began developing the High Valyrian and Low Valyrian languages. These languages became more prominent as the storyline moved away from the Dothraki: only one line in the Dothraki language appeared in Season 3, and none in Season 4. High Valyrian is supposed to be roughly analogous to the role than Latin played in our world. http://www.vulture.com/2013/04/game-of-thrones-dothraki-language-inventor.html There are other dialects of Valyrian that are diverging into separate languages, similar to how Latin diverged into Italian, Spanish, French, etc. Just as an Italian might benefit from a translator when speaking with someone who speaks French, Missandei is useful when Daenerys is speaking to someone who speaks a Low Valyrian dialect/language. Why was Mossador afraid of death? Why does Michael Corleone need a bodyguard to translate for him when he first met Apollonia's father? Was Kraznys mo Nakloz naive to hand over the Unsullied to Daenerys? What title does Padmé Amidala have? Do we ever see any visions in the fire? Why did Daenerys say this in “The Queen's Justice”? Why does the girl need ox heart to give her favours to the ugly monk? Why did Daenerys not take the grain?